Pricing Specified below with the products are purely for the technical specification mantioedn in product Decription. Price will vary with the Specification. 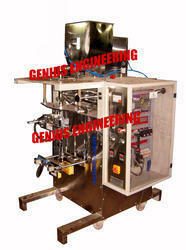 Automatic Collar Type Form Fill And Seal Machine With Servo Operated Auger Filler. To be conveyed in mm. For 500gm: Approx. 25 pouches per minute. For 1000gm: Approx. 20 Pouches/ Minute. Through clutch & brake mechanism. Microprocessor controlled MMI with PLC (Schneider / Delta/ Siemens Make). Yes (Schneider / Delta/ siemens make). We are the leading manufacturer and supplier of Auger Filler Pouch Packing Machine or Automatic Collar Type Form Fill Seal Machine with Auger Fillers. 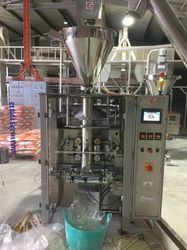 It is an ideal pouch packaging machine with Servo operated Auger filler to pack various products at high speed like Flour, maize flour, custard powder, henna powder, Instant coffee powder, spices, milk powder, glucose powder, protein powder etc in center seal pillow type PP/ LDPE bags. our product are having such optional features like Controlled by PLC with color touch screen, AC Servo drive / AC Inverter drive for pulling paper, Self diagnostic, Easy loading of film roll. Sticky & hygroscopic powders like flour, milk powder, besan, spices, Henna powder, protein powder, washing powder, maida, lime powder etc. Four side seal/ Three side seal/ center seal. As per requirement (to be conveyed in mm). Approx. 25- 30 pouches/ minute. Programmable logistic control (Delta make). Through Pneumatically driven clap type sealing jaws. Packaging Details: EQUIPMENT FASTENED & SUPPLIED IN SEA WORTHY WOODEN PALLETS. 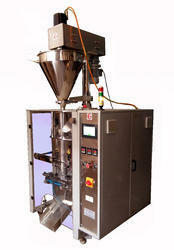 Automatic Collar Type Shisha Tobacco packing Machine With Horizontal Auger Filler. Shisha Tobacco/Hookah Tobacco/ Pipe Tobacco. For 50gm: Approx. 20-22 Pouches per Minute. For 100gm: Approx. 15- 20 Pouches per Minute. Through Clutch & Break (Unitorue make). 5.7’’ (Touch screen, color display). (Siemens/ Delta/ Schneider make). 6 CFM @ 6Kg/cm sq. 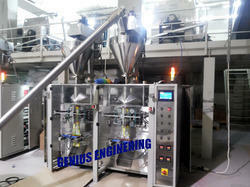 v Change parts/ Collar & forming pipe for 100gm pouch size. Production Speed Approx. 30-35 Pouches per Min. Packaging Details: Equpment Fastened & supplied in sea worthy wooden pallet. Packaging Details: wooden pallet at an extra cost. 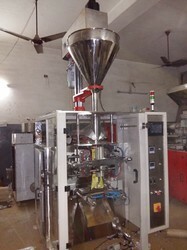 We manufacture and export wide range of Semi Pneumatic FFS Machines with Auger filling option that is Suitable to pack sticky & hygroscopic powders like flour, milk powder, besan, spices, Henna powder, protein powder in three side/ four side/ center seal pouches. All parts of the machine are properly processed & strictly inspected. Flours, spices, besan, Maida, washing powder, lime powder, bleaching powder, milk powder etc. Approx. 25- 30 pouches per minute. ½ H.P, 220V,A.C 50 HZ Single Phase Motor. 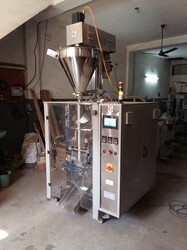 Capacity 50gm to 100gm/ 100gm to 250gm. Servo driven ( 1 KW, Delta Make). Packaging Details: sea worthy wooden pallets at an extra cost paid by buyer. 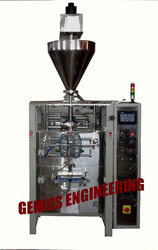 SEMI AUTOMATIC LOADCELL AUGER FILLER WITH STAND (5KG & 10KG). 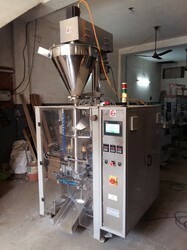 Auger Screw filler (Brake motor operated). 3 HP Brake motor (Bonvario make). Approx. 5 to 6 pouches per minute. Plot No. 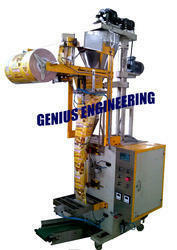 27/47-48, Laxmi Ratan Industrial Complex Near Hardware Chowk, N. I. T.
Lined Carton packing machine for granules.